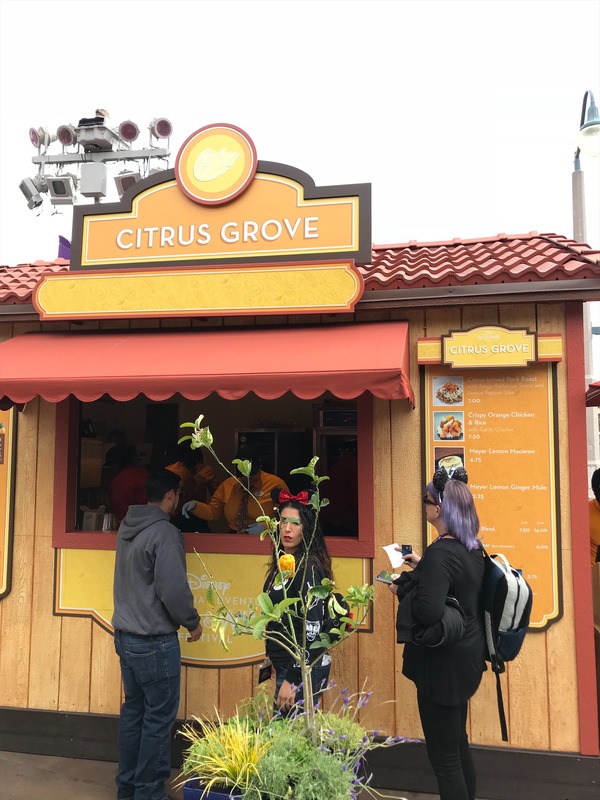 There are 13 different Festival Marketplaces located throughout the park, plus a Beer Garden,and a limited time special menu at Paradise Garden Grill. 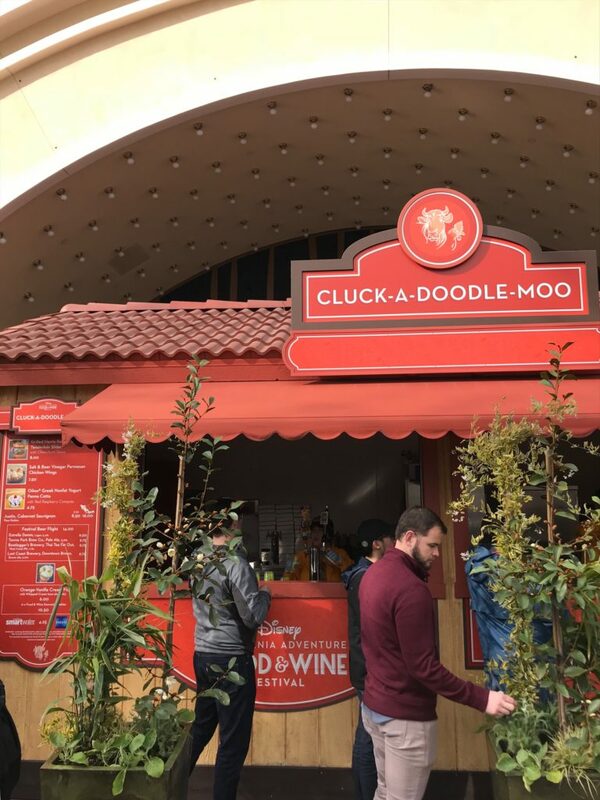 The Festival offerings have gluten free, kid-friendly, vegetarian, and vegan options. Be sure to grab a Tasting Passport to find the specifics. If you are an Annual Passholder, the Sip and Savor Pass has returned! 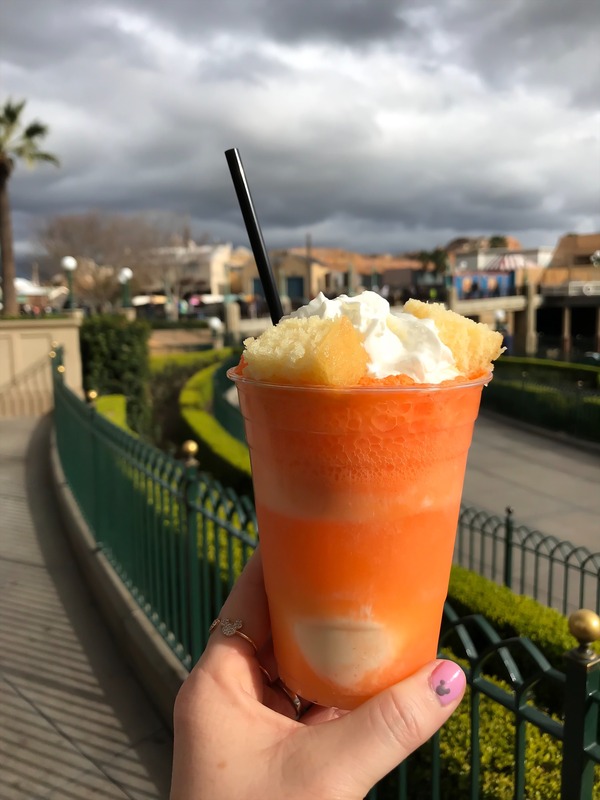 The Sip and Savor Pass is good for eight select food or non-alcoholic beverages items from any of the participating Marketplaces. 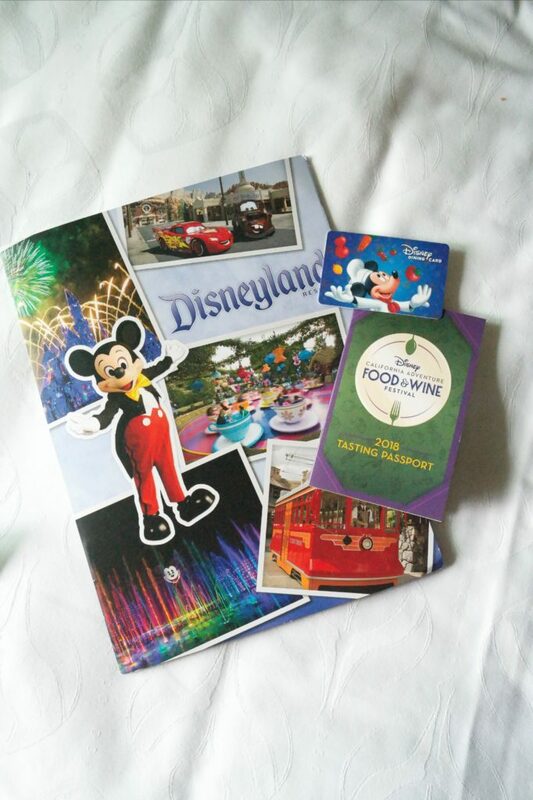 The eight coupons can be used all at once, spread out over one visit, or used on multiple visits while the Festival is going on. 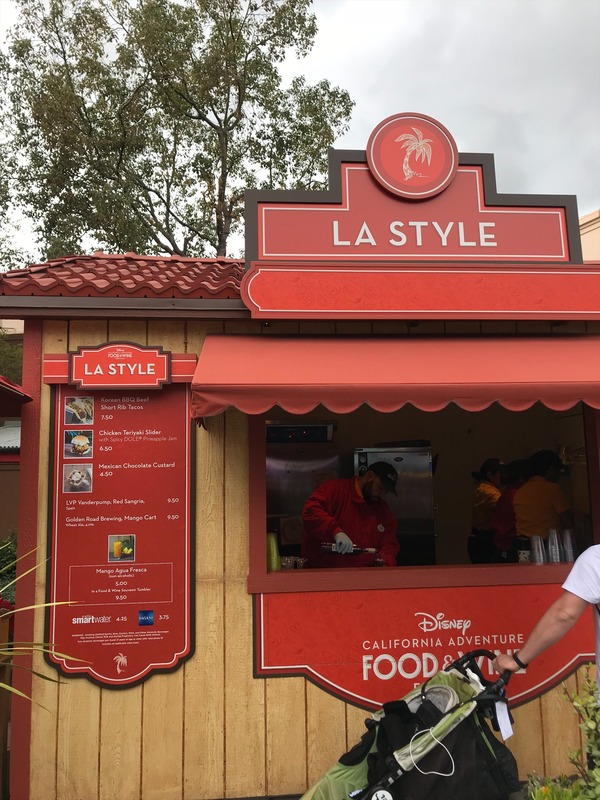 I went for dessert at LA Style and ordered the Mexican Chocolate Custard. 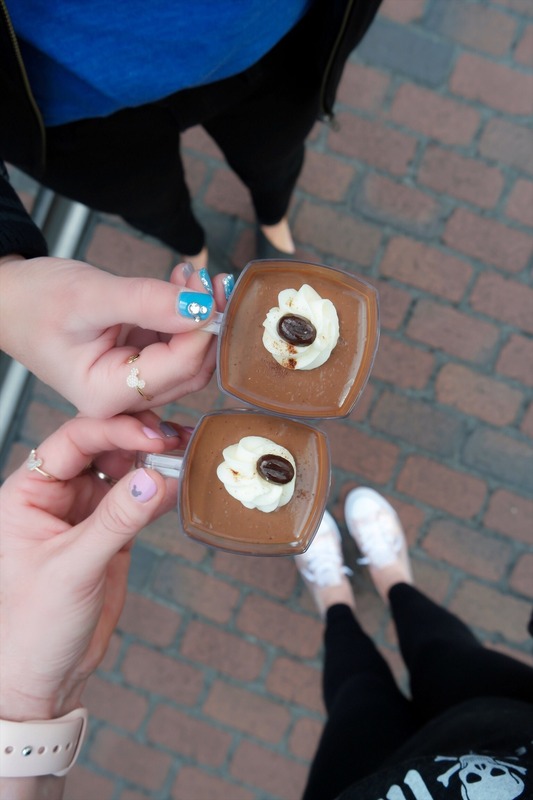 It is topped with whipped cream and a chocolate covered espresso bean. I didn’t expect much going into it since it is basically a pudding, but it is so much more and blew me away. It is really rich and creamy!! The chocolate has a nice spice to it and the whipped cream is slightly salty in the best way. This is a treat I will be ordering again. 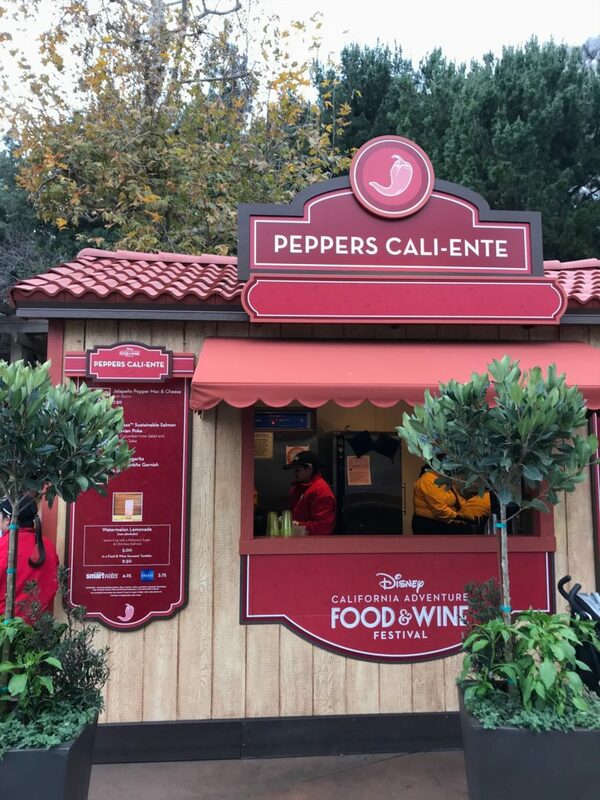 One of my favorite bites at Peppers Cali-Ente is the Jalapeño Popper Mac & Cheese with Bacon. There is so much texture to it. 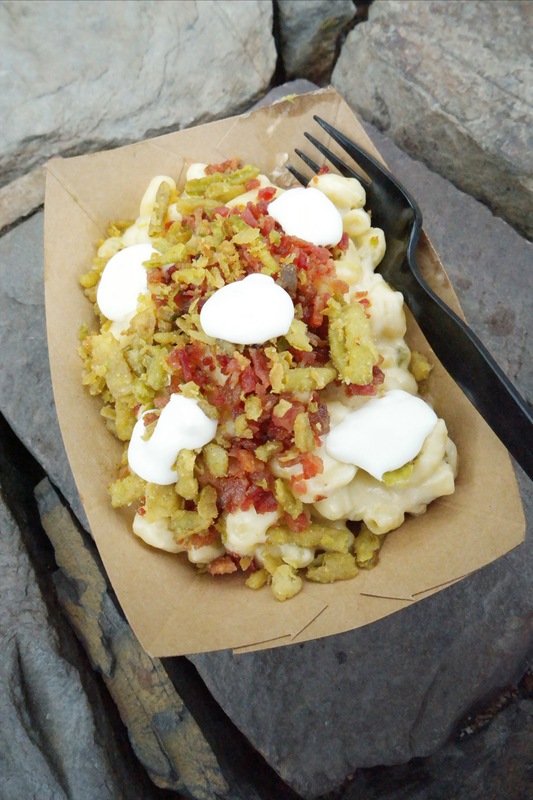 Crispy jalapeños, chewy bacon bits, creamy & cheesy mac & cheese. Do not hesitate to order yourself this dish! 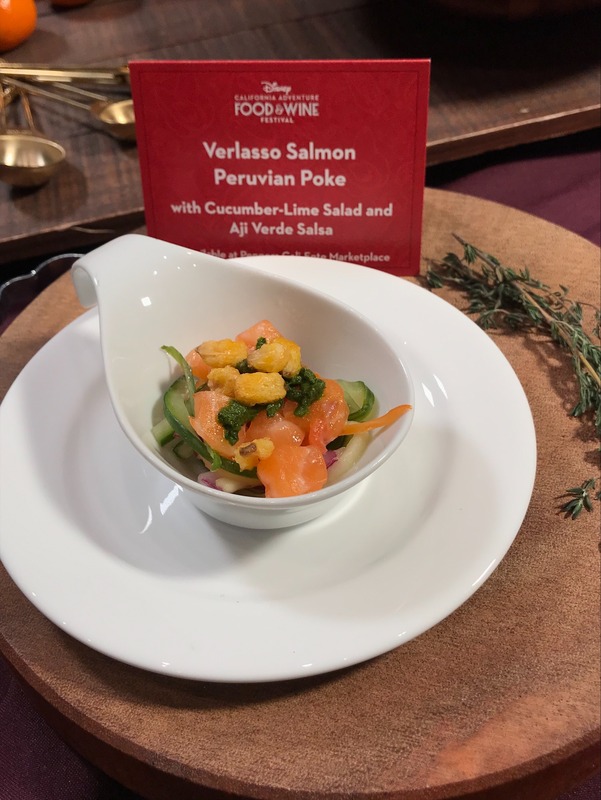 I love poke bowls, so I was excited to see the Verlasso Sustainable Salmon Peruvian Poke with Cucumber-lime Salad and Aji Verde Salsa. 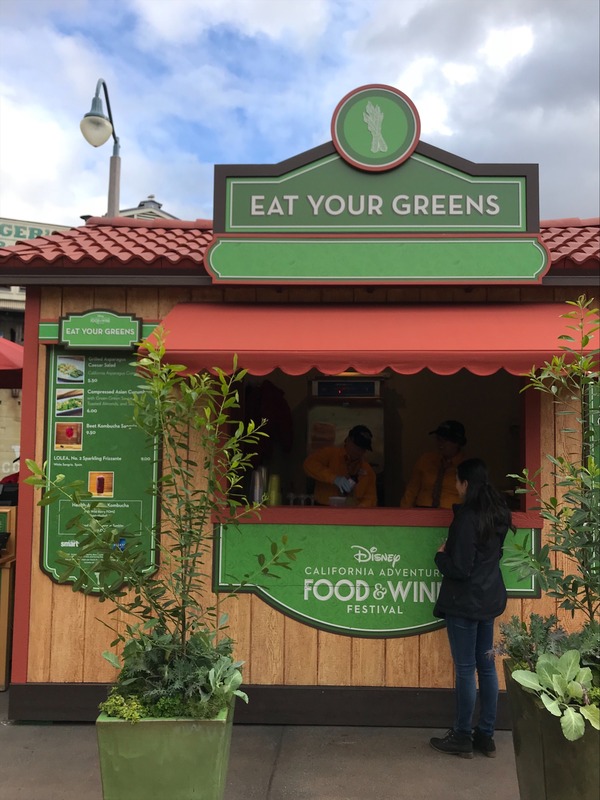 It is refreshing and nice to have a healthy option available. 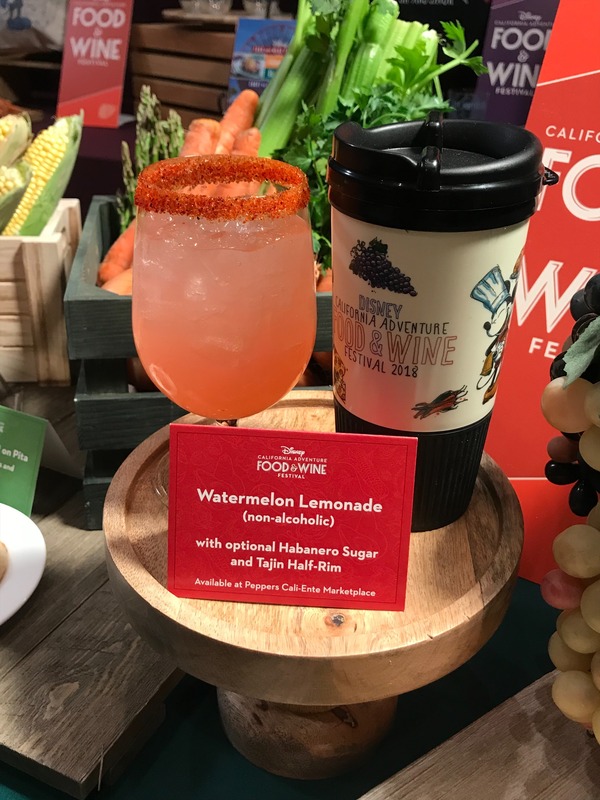 Watermelon Lemonade with a Tajin rim (non-alcoholic) was one of my favorite parts of Summer of Heroes last year so I was super stoked to see it on the menu at Peppers Cali-Ente. Just as good as it was in the Summer! 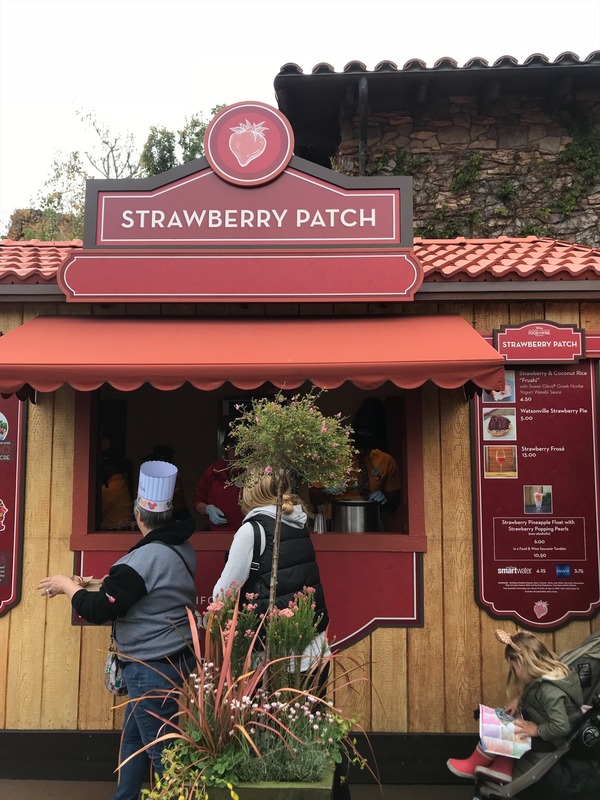 Okay I will be honest with you, I was most excited to try the “Frushi” from Strawberry Patch, but sadly I did not care for it. 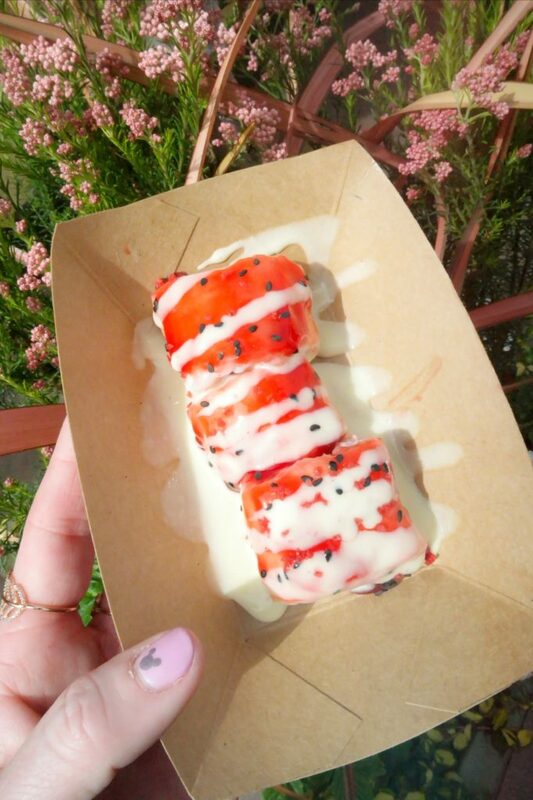 It is Strawberry & Coconut Rice with Sweet Oikos Greek Nonfat Yogurt Wasabi Sauce. Mine was swimming in the Greek Yogurt Wasabi Sauce, which made the wasabi extremely strong. It was a bit off putting for me. But love the concept! 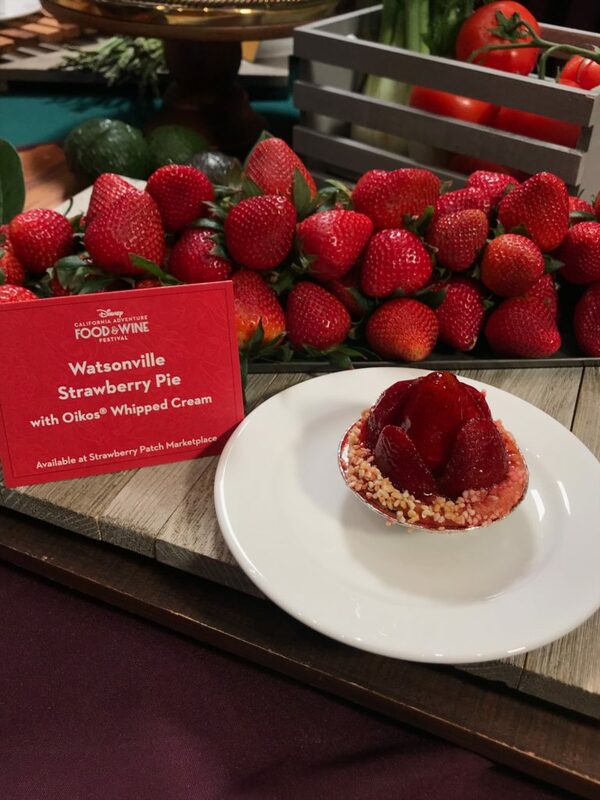 Watsonville Strawberry Pie, major cuteness! I can’t resist a mini pie, and this one is no exception. 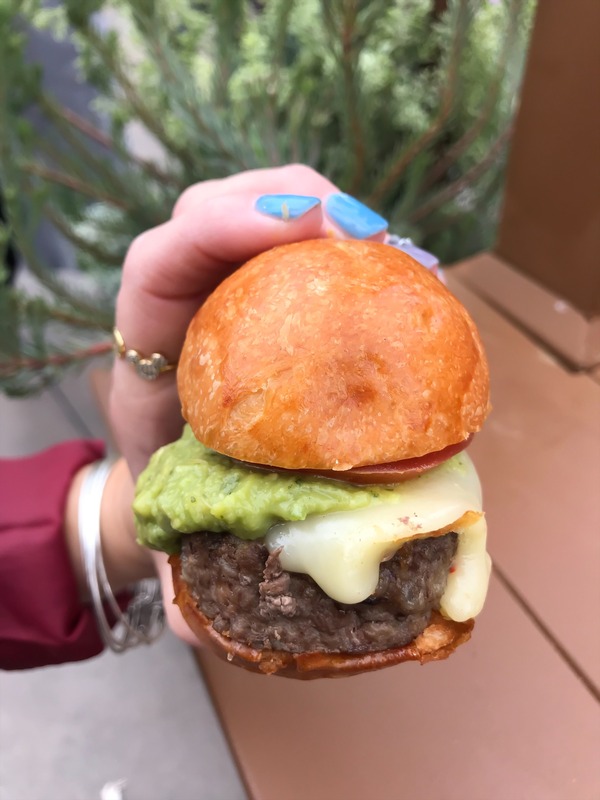 Avocado & Pepper Jack Petite Guacamole Burger – pepper Jack is the best cheese on a burger in my opinion. 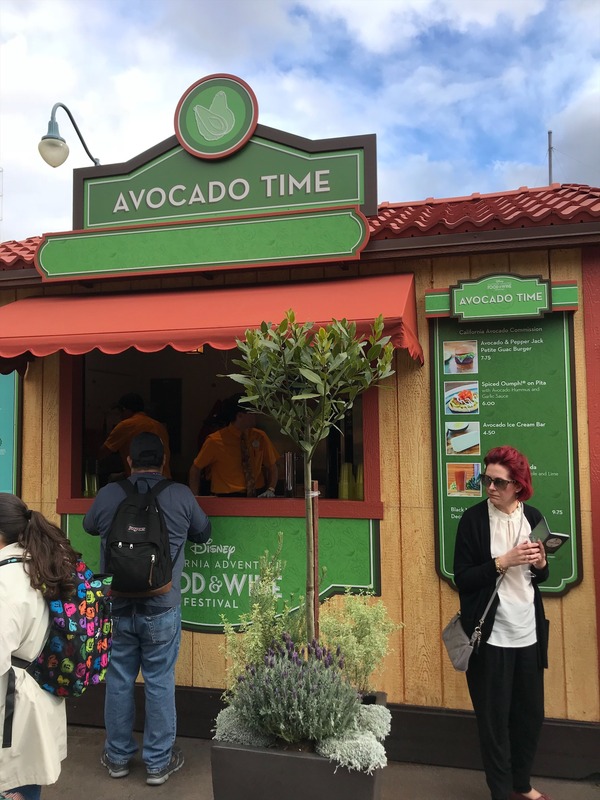 The meat is really flavorful, but I have to admit I don’t like guacamole much, so I didn’t try that part of the burger. I had the Spiced Oumph! 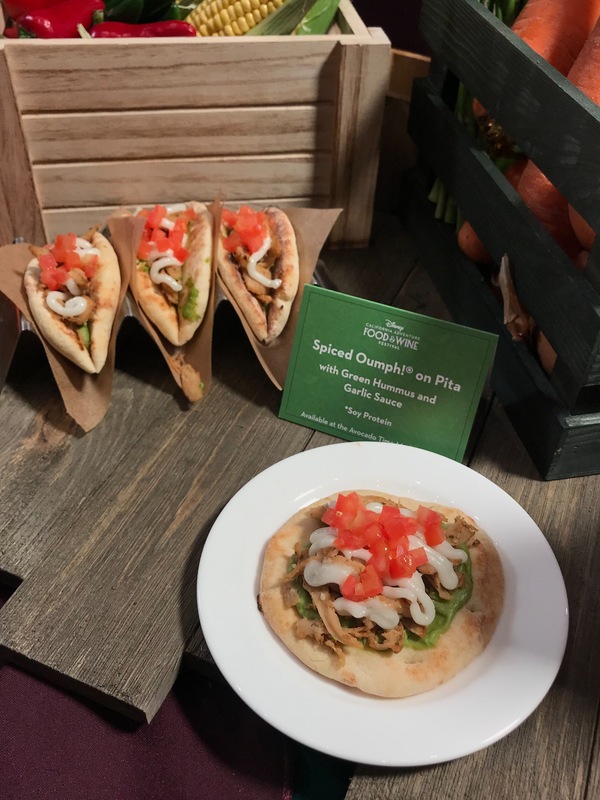 on Pita with Avocado Hummus and Garlic Sauce at the luncheon I attended. I didn’t realize until the Executive Chef was going over each dish, that it is vegan. What I thought was Chicken Schwarma is soy protein based. I would not have know different had I not been told otherwise. 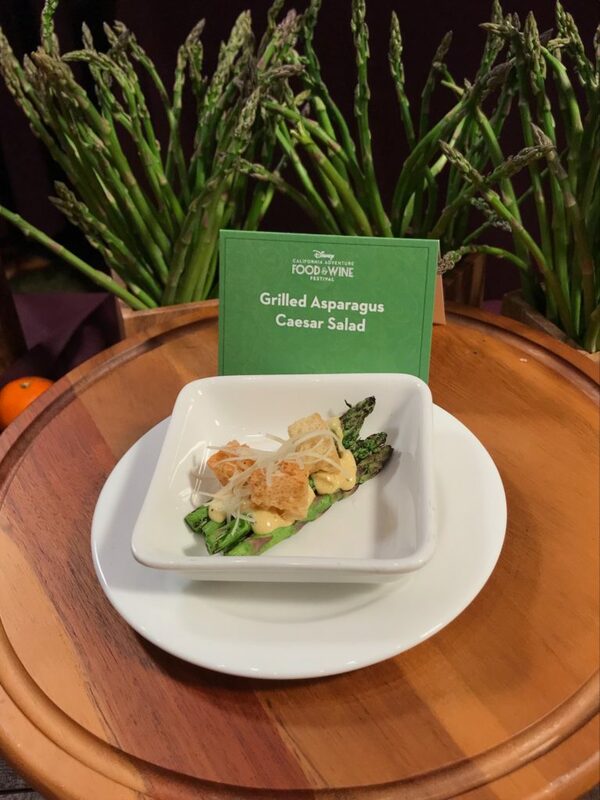 The Grilled Asparagus Caesar Salad from Eat Your Greens is one of the best dishes I had at the Festival. Totally going to replicate this at home! I never thought to replace romaine lettuce with asparagus. 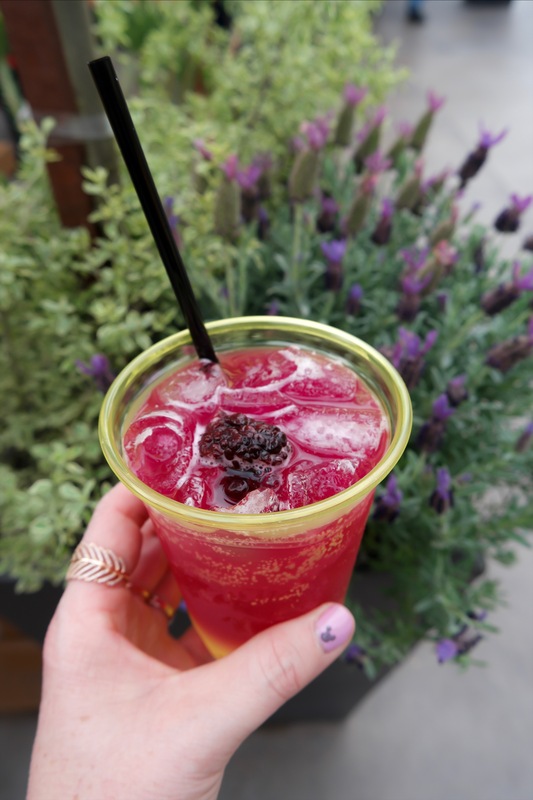 Eat Your Greens is serving up a Beet Kombucha Sangria. Admittedly, I don’t like beets or kombucha, but the sangria sounded so interesting that I had to give it a try. 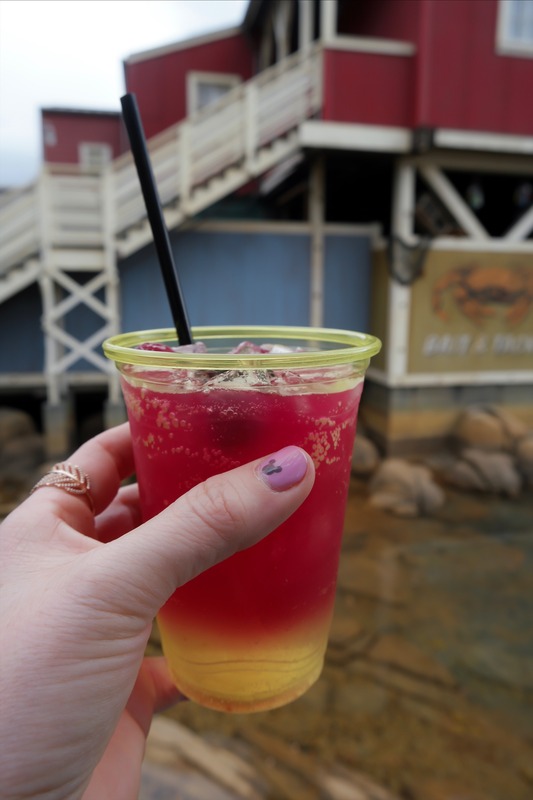 Glad I did, it is not only pretty, it is refreshing and bubbly. I’m almost tempted to make myself one at home. OMG! 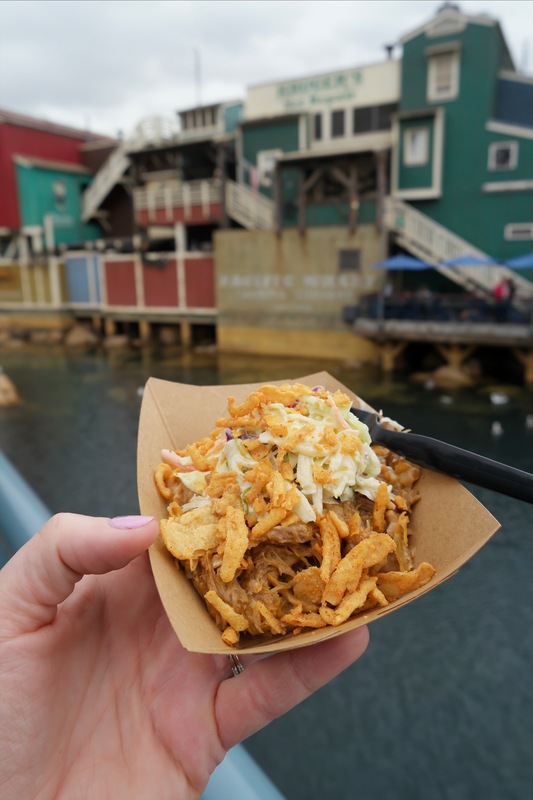 The Citrus-Brined Pork Roast with Tangy Barbecue Sauce and Lemon Pepper Slaw one another favorite of the festival. 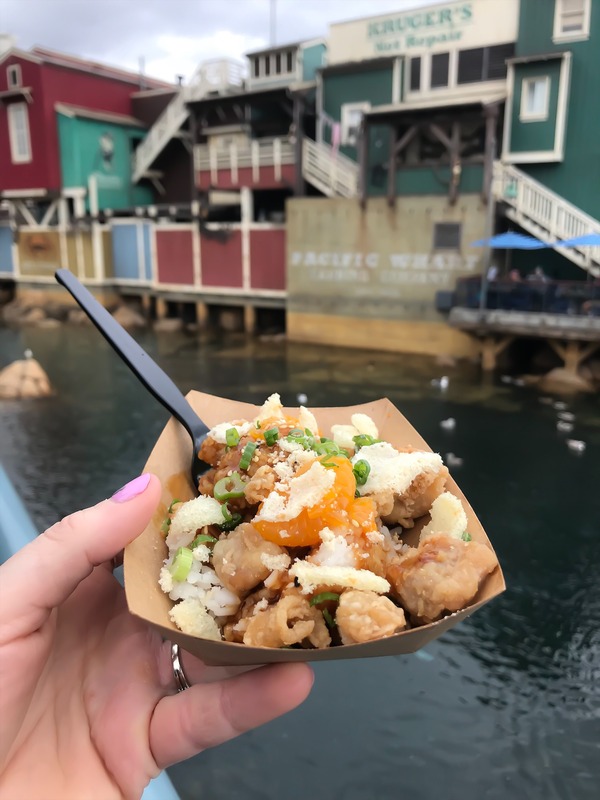 If this was a dish always at the park, I may order it every visit. The pork was so juicy, I loved the slaw and the texture from the crispy chips on top. All around great texture and flavor! Crispy Orange Chicken & Rice with a Garlic Cracker is good. I am really into texture so I enjoyed the crispy chicken on top of soft rice and the crackers on top. 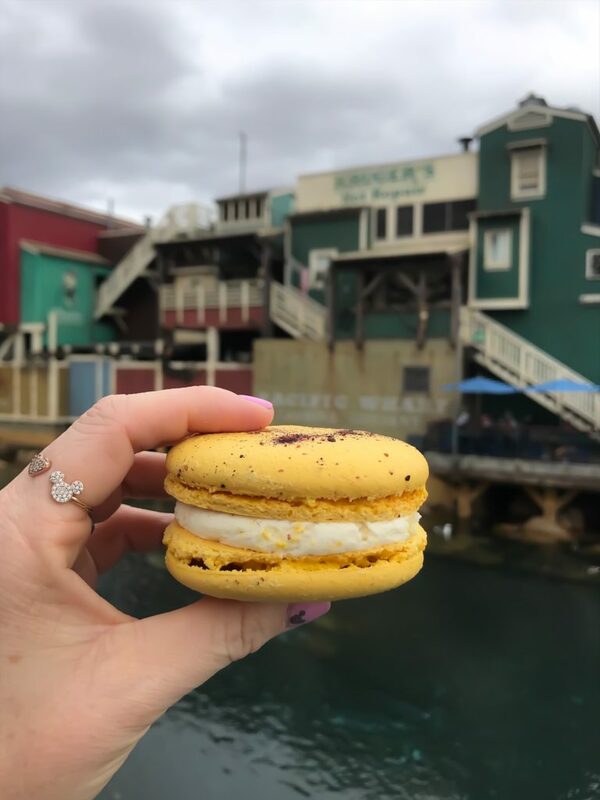 I had the Meyer Lemon Macaron the past two years, so I happily had another one this year. I am a big fan of Meyer Lemon, and this mac is packed with it’s lemon-y flavor. In the center is a blueberry coulis. Treat yourself to this one! 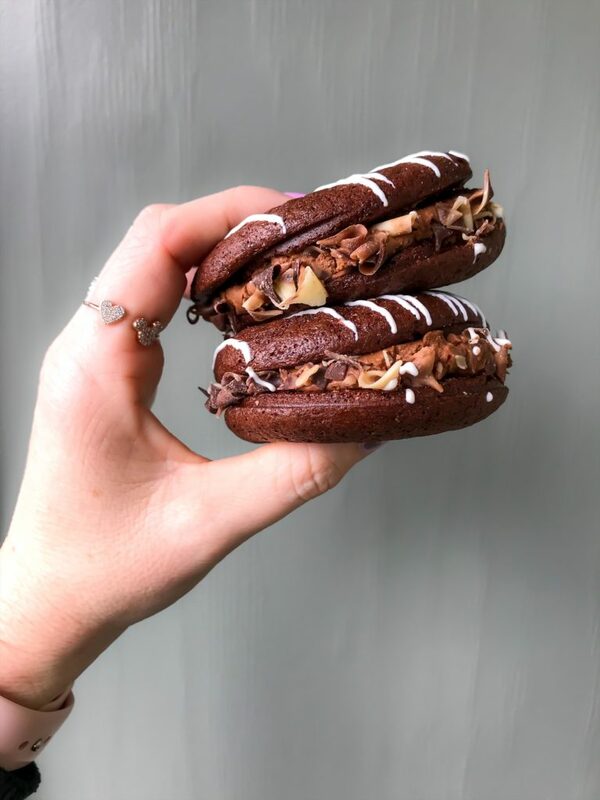 Bourbon Chocolate Whoopie Pie from I Heart Artichokes is worth the splurge! 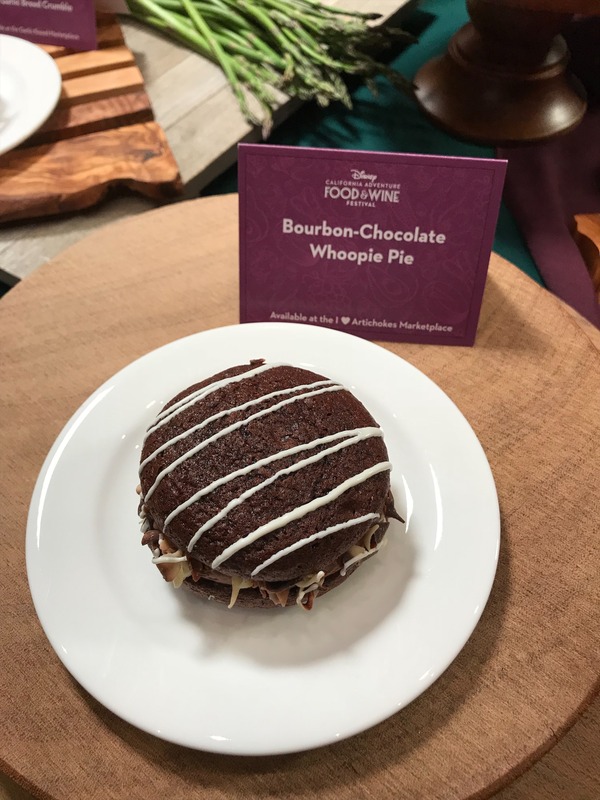 It is chocolate cake sandwich, chocolate bourbon mousse, in the center is a spicy chocolate ganache, and chocolate shavings. 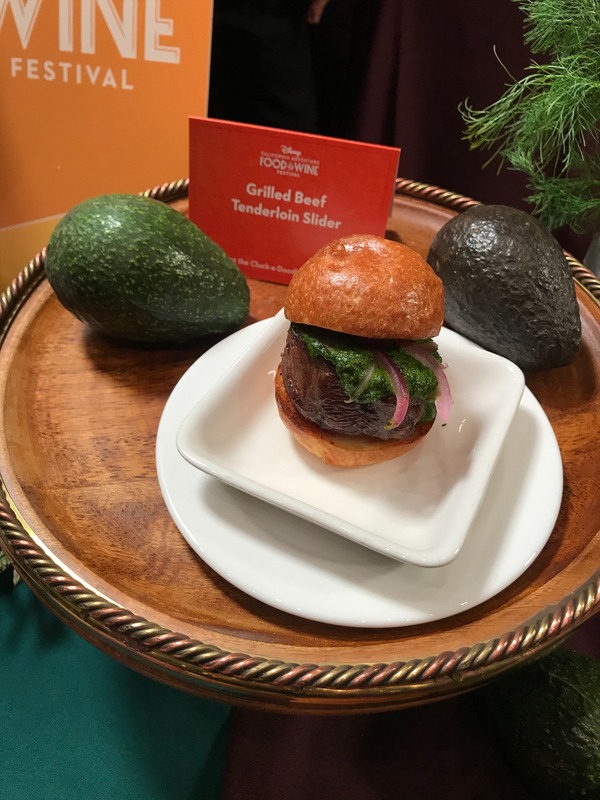 Grilled Harris Ranch Beef Tenderloin Slider with Chimichurri Sauce – the meat is incredibly tender and fresh. I ended up removing the bun and only eating that part. Enjoyed it! 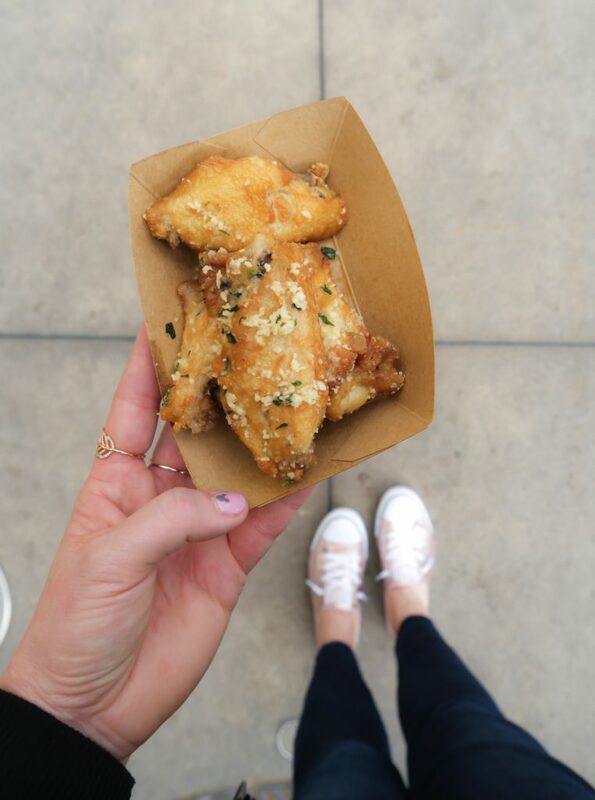 The Salt & Beer Vinegar Parmesan Chicken Wings may be my very favorite bite at the Festival. I always enjoy Salt & Vinegar salty snacks, but have never had it on chicken. The parmesan cheese added an even greater salty taste to it. The wings were really moist too! I will be ordering this dish on another visit! 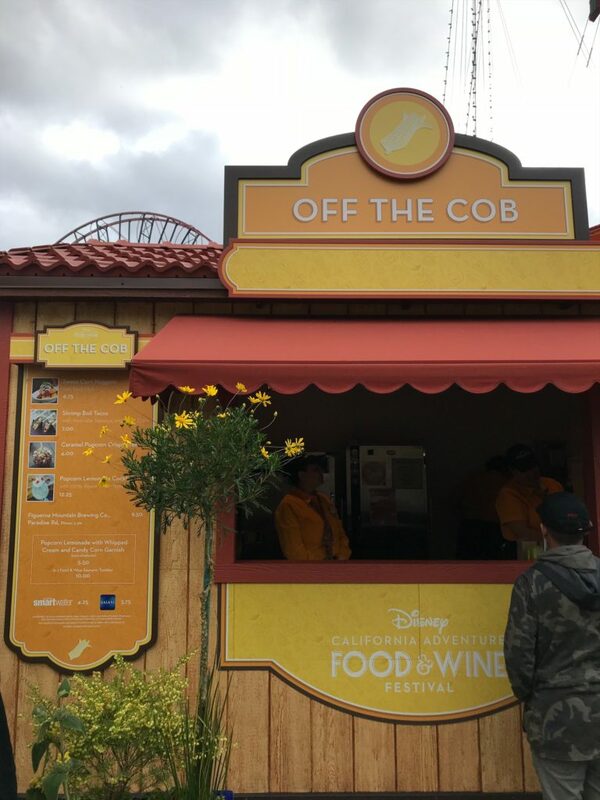 When I first caught sight of the Caramel Popcorn Crispy Treat from Off the Cob, I had to giggle. It is a treat my boys would probably laugh at as well. 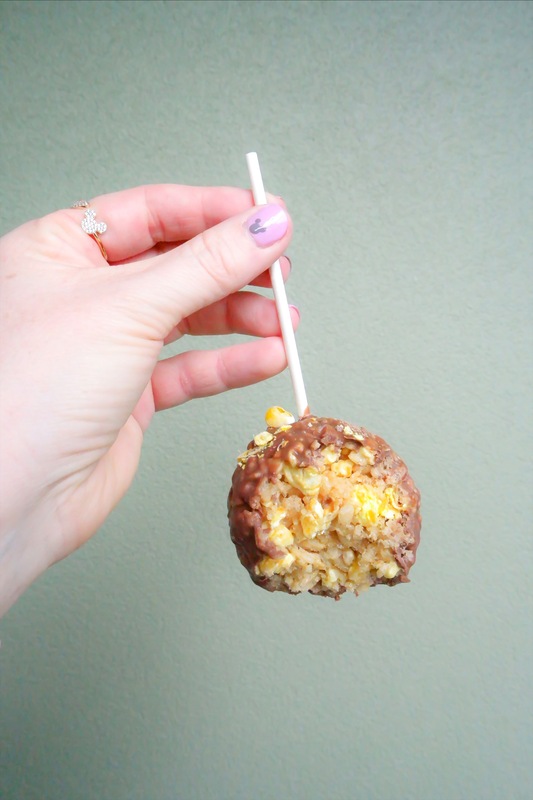 It isn’t the prettiest crispy treat, what it lacks in appearance, it sure makes up in flavor. 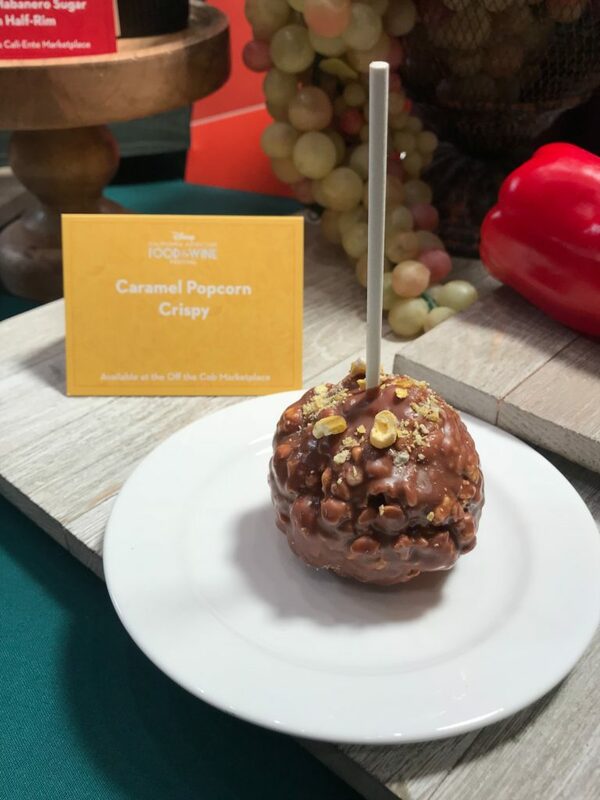 The Caramel Popcorn Crispy Treat is rice crisps and caramel corn coated in marshmallows and dipped in chocolate. It is a tasty crispy treat!! Yay to another mac & cheese dish at the Festival! 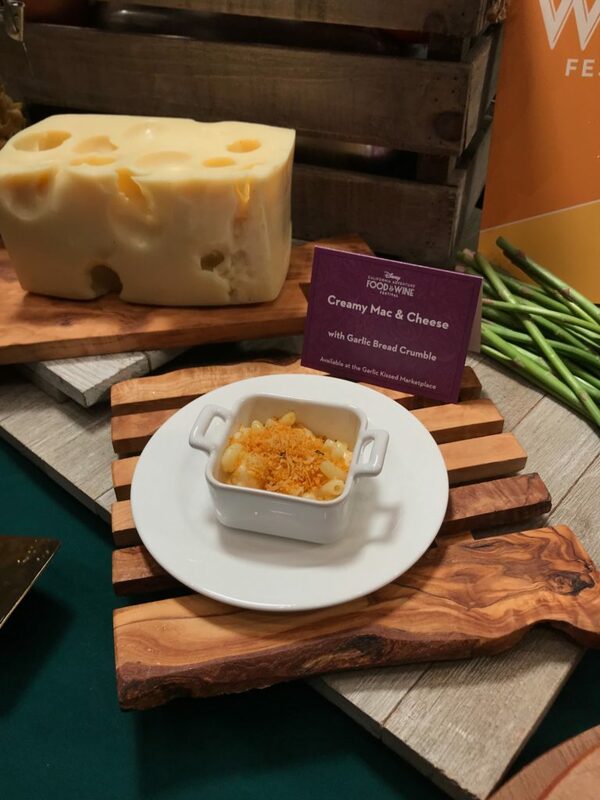 The Creamy Mac & Cheese with Garlic Bread Crumble from Garlic Kissed is great. Creamy, cheesy mac & cheese topped with crispy garlic bread crumbs. Another winning mix of texture! 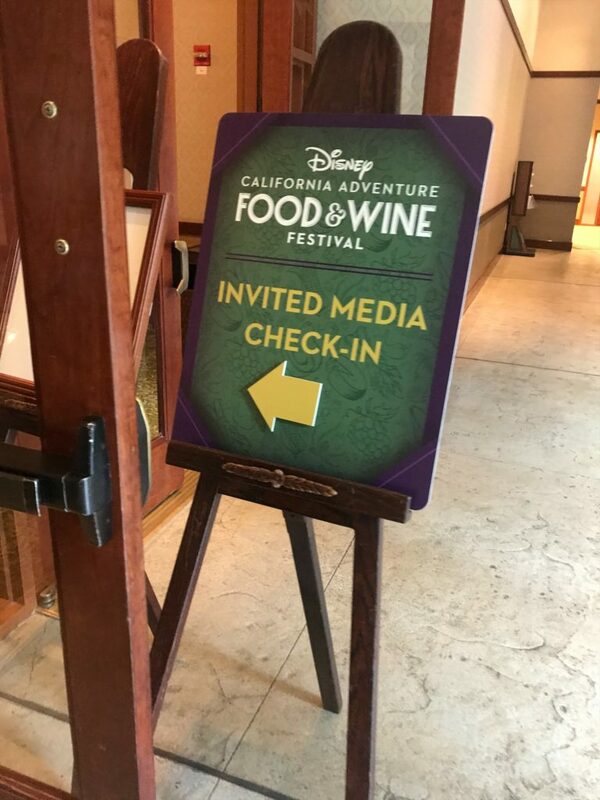 That concludes the tour of my Food & Wine Festival eats! The Marketplaces I did not get to check out during my visit was California Craft Brews, Uncork California, and Nuts About Cheese. But I hope I can get to them on my next park visit. The Festival has a wide variety of apparel, items for your home, collectible art to commemorate your visit. 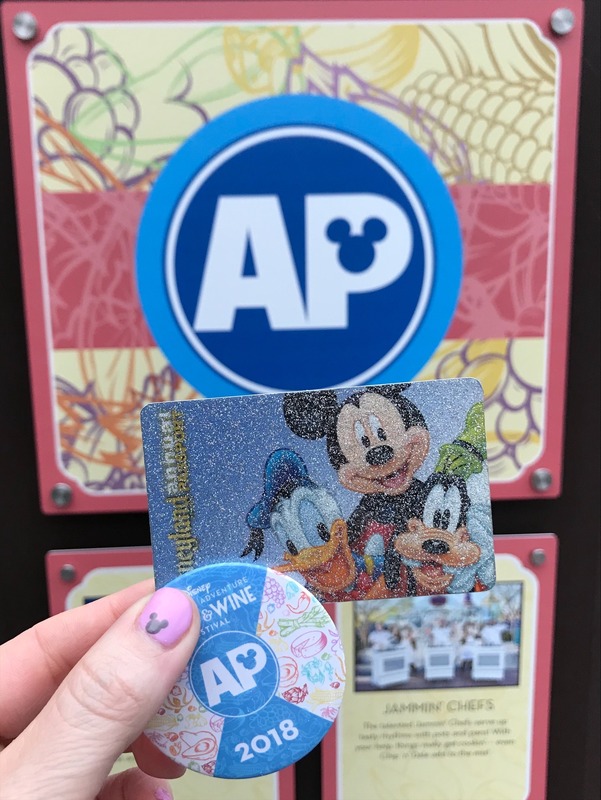 For Annual Passholders, you can grab an exclusive button in Hollywood Land and have a special photo opportunity. In addition to the Festival Marketplaces, there is Celebrity Chef LIVE! 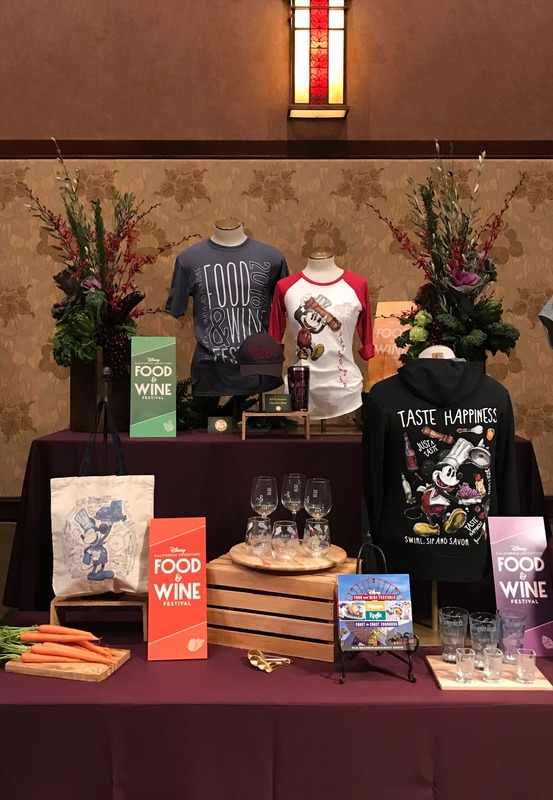 at the Hyperion, Tasting Seminars, Culinary Demonstrations, Family Friendly Seminars, Jr. 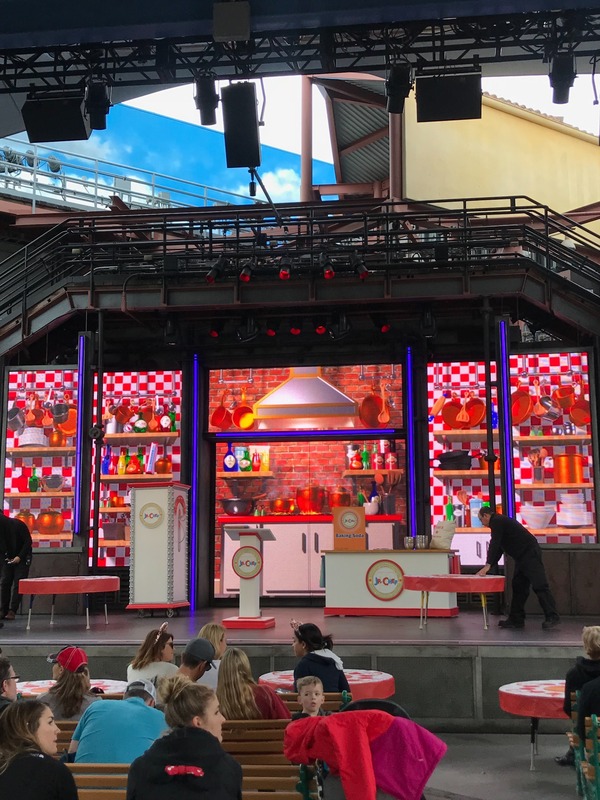 Chef, where kids ages 3-11 get a hands on cooking “experience” with Chef Goofy, and so much more. 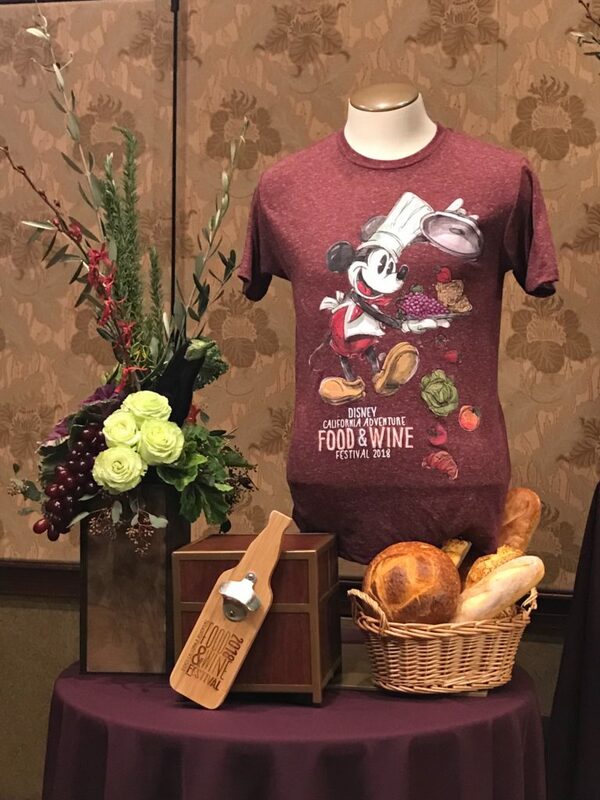 Check Disneyland’s website for even more details of the Food & Wine Festival. Looks sooo good! 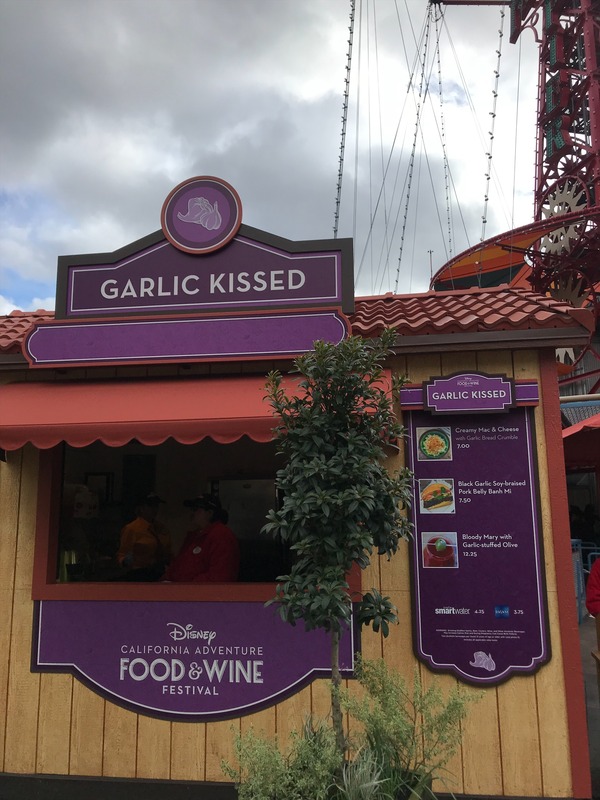 Tell me more about these GF options!